Annie Elizabeth Newby Walter was born June 26, 1861, in the small village of Bishop Wilton, Yorkshire. Unfortunately little else is known of her family life. In 1880, at the age of 15, she left England in the company of 16 families bound for the Canadian West. This group was heading out to establish a Methodist mission settlement. It appears that Annie was employed by one of the families to assist the mother of twins. Annie's motive for joining this group is not known. The prospects for many single English women at this time were quite bleak in terms of finding a husband as there was indeed a "shortage" of bachelors to choose from and career options were limited. Perhaps the lure of the Canadian West, with its potential opportunities of work or marriage, appealed to Annie like many other women at this time. Societal norms dictated that single women did not travel alone. Therefore, if a woman wished to undertake such a journey, she would have to find either a family or a migration agency to travel with, as Annie had found in the Methodist missionaries. The group stayed in Toronto for 2 years, gathering supplies and equipment required for the western journey. In April 1882, they travelled by rail as far as they could, which was Brandon, Manitoba. Unfortunately that year had been a flood year, so the waterways were running high and the trails were wet and muddy. For travellers with no previous experience with an ox-cart train, the travel was complicated and tough. However, Annie was not deterred. In an interview given by Annie when she was 70 years old she noted "the prairies were beautifully green; game plentiful; prairie chickens and ducks shot on the way were plucked by the women as they rode along on the ox-carts, so as to be ready when camp was made." Indeed, it appears that Annie enjoyed the adventure of travel in a new land, which speaks to her character. EA-793-115. Oxen pulling a wagon. This would be similar to how Annie would have travelled across the prairies. While in Brandon waiting to set out on the trek, Annie's situation changed considerably. One of the twins that Annie was charged to look after died, so her services were no longer needed on the journey. Fortunately the party had just made the acquaintance of a woman who was heading out to the McDougall Orphanage and Training School in Morley to be a cook and housekeeper. 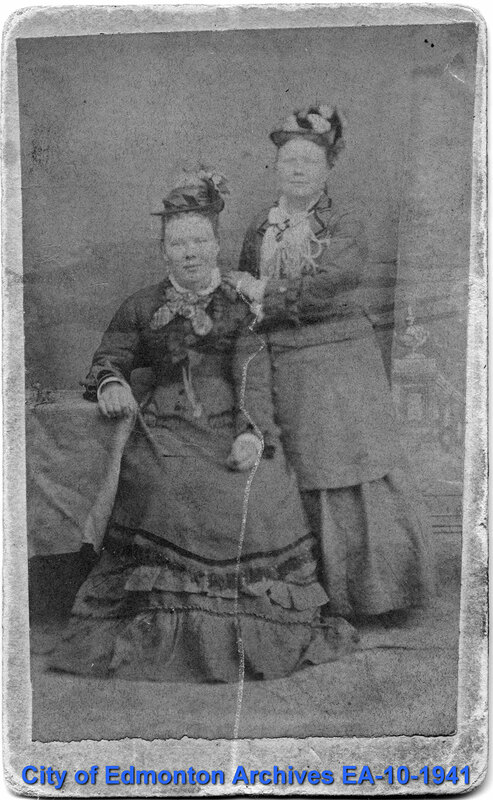 This woman joined the party to travel across the prairies and invited Annie to be her assistant at the Morley School. The party reached their destination of Pheasant Creek near Wolsey, Saskatchewan. How Annie and the woman made their way to Morley is not known. Annie stayed at Morley for 4 years. Morley was the site of the first Protestant mission in the region, and by the 1880s it included the McDougall family home, the orphanage, teacherage, barns and outbuildings. It served as a day school and orphanage for some of the Stoney-Nakoda and Blackfoot children of the area. During this time, Annie became acquainted with Mrs. Clara Hardisty, the sister of Rev. 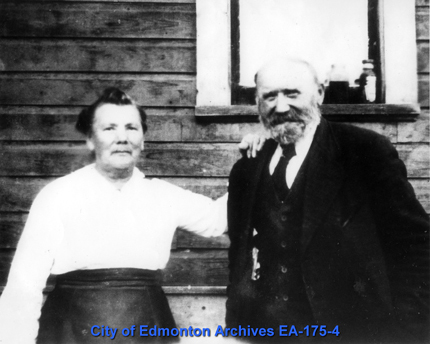 John McDougall, and wife to Richard Hardisty, Chief factor of Fort Edmonton. The Hardistys offered Annie to come work for them, most likely to care for their youngest of 3 children, 7 year old William Percy. They offered her a 5 year contract, just like a Hudson's Bay Company contract. It is said that Annie was not interested in committing to 5 years as she had "an ambition to become a high-class French pastry cook and intended to go east to New York to become apprenticed to a pastry cook of renown." They agreed to a 6 month term and in 1886 they set off for a 5 day journey to Edmonton. 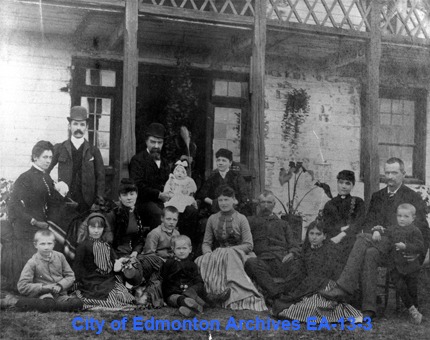 EA-13-3 Photograph of 3 families in front of the Big House at Fort Edmonton in 1884. Clara Hardisty is sitting in the center, front row. Annie came to Fort Edmonton to tend to these children. It was on April 2, 1886 that another chance encounter changed the course of Annie's life. The Hardisty party was set to cross the North Saskatchewan River from the south bank to reach Fort Edmonton and the Hardisty home. There was "a man in white shirt sleeves leaning on the fence around his house" waiting to operate the ferry for their crossing - John Walter himself. A strong impression was obviously made and after a 6 month courtship, John and Annie were married. The wedding took place in the Hardisty residence inside Fort Edmonton. Though Annie gave up her dream of becoming a pastry chef, life in the growing community of Edmonton was filled with possibilities. By the standards of the time, John Walter was well established. He had just completed building his second home, was running several businesses, was close to his sister and her family, and was held in good regard by the Hardisty family, his former employer and current contractor. 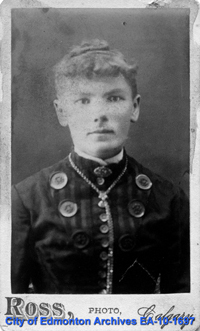 EA-10-1697 Annie in 1886, 25 years old. This is the cabinet card that John and Annie had done after they had married in October. 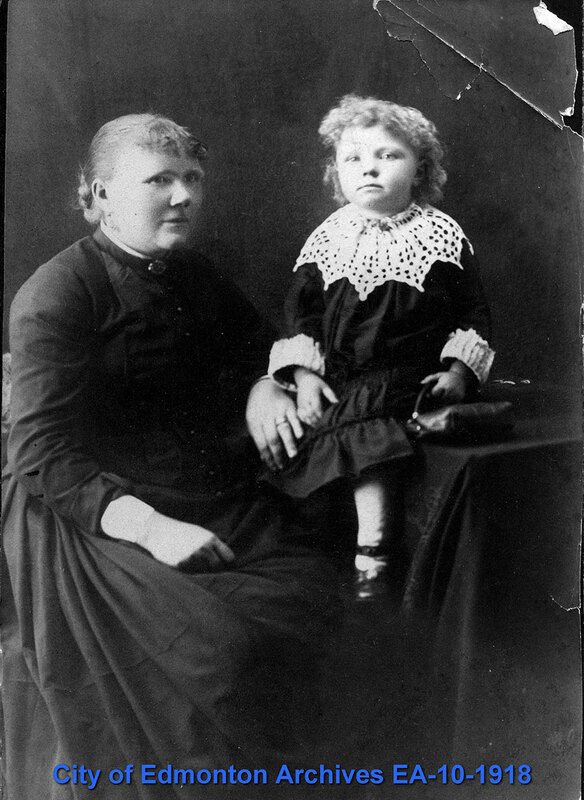 Annie went on to set up house and gave birth to 2 children, John William Walter in 1887 and Stanley Walter in 1890. In these early years of childrearing it is likely that she employed other women to help with the endless domestic chores. It is possible that she had live-in help from a young woman, or like Lovisa McDougall, employed local Métis women to assist with the housekeeping and childrearing. Her days would have been spent looking after home and children and also helping out in the businesses. 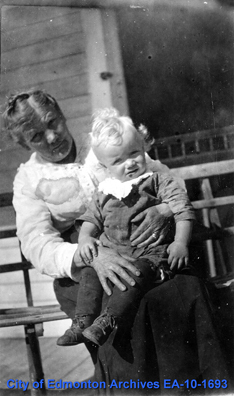 As the children grew older, she took on a more active business role collecting rent from the rental properties owned by the family and also acted as a Director for the Walter Lumber Company. After John passed away, Annie stayed on in the green house in Walterdale. It was said that she always had the company of her canary birds and at least a dog or two. Her grandchildren would frequently come for visits with "gran." The memories shared of Annie at this time are of a woman who enjoyed a good laugh, liked her music and parlour games, and above all loved her family. She died November 20, 1942 at the age of 82 as an honoured Edmonton pioneer. EA-175-4 Annie and John, circa 1920. John was the eldest of the Walter boys, born August 6, 1887. 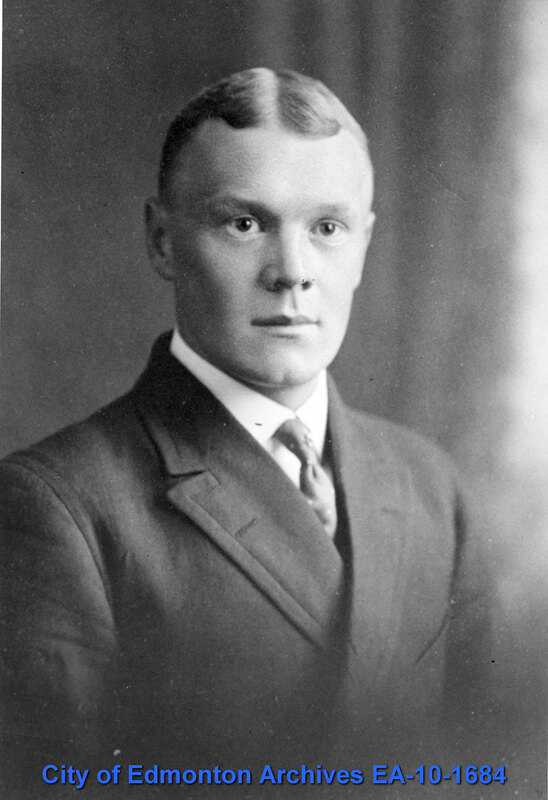 Stanley was born in 1890. 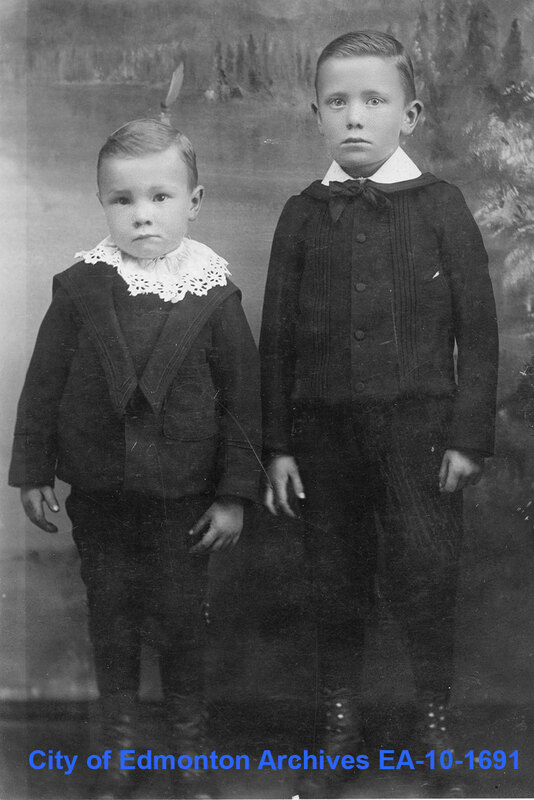 One can speculate that for John and Stanley, a childhood growing up in Strathcona at this time was filled with school, chores at home, time spent on the river, and involvement in the community, perhaps through the Methodist church. It appears that the Walter boys had a close relationship with their Sache cousins - Nellie, Frances, and Willie - the children of Mary Walter and Frederick Sache. When the boys grew older, they also spent some time working for their father in the sawmill. In 1916, at the age of 29, John Jr. went to farm on the homestead that his father, John Sr., had purchased in 1911. This land was by Sandy Lake near Ellerslie. John soon married Victoria Hewitt and they had two children, Louis John and William. John worked on his farm and was involved in his community and family. He passed away in 1968. 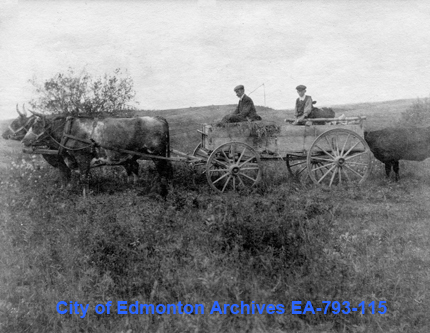 In 1918 at the age of 28, Stanley went out to Ellerslie to farm as well. Stanley married Elizabeth Turner and they had two children, Ellen and John. Stanley passed away in 1962. Mary Walter was born in 1856 and was the third child to William and Helen Walter of Stenness, Orkney. Mary came to Edmonton in 1881. Unfortunately, nothing is known about how and with whom she made that trip. Obviously she came to join her older brother John and presumably she resided in his house. In the Edmonton Bulletin in 1882 and 1883, there is mention of a Miss Walter winning prizes for her handiwork in the Edmonton Agricultural Exhibition. Also in 1883 it was noted in the Edmonton Bulletin that Miss Walter travelled with Mrs. Ross and family on the Northcote Hudson's Bay Company steamer to Fort Saskatchewan. At some point, Mary made the acquaintance of Fredrick Sache. Fredrick, born in Perth, Ontario in 1849, came out West with his uncle on the Dominion survey party. Fred arrived at Fort Edmonton in 1872 and decided to stay. He initially began homesteading in the area. Fred and Mary were married and had their first daughter Helen in December 1885. At this time they were temporarily living in John Walter's first house though soon after they moved to another home on the south side. Mary and Fred went on to have 2 more children, Frances and William. Unfortunately, we know little about Mary. We can assume that she would have been busy raising her children and looking after her home. We do know that she was skilled in her handiwork as she frequently placed first and second prize in the Edmonton Exhibition for knitting and quilting. She remained close to her brother as Fred and John went into several business ventures together. Fred passed away in 1911. In 1921, their daughter Frances married Henry Flockhart Christie, the son of a prominent Edmonton family. And in 1927, Mary passed away. Ellen Walter was born in 1885 and was the second born child of William and Helen Walter. It is possible she remained in the Orkneys and married William Leslie there. They had 6 children together. 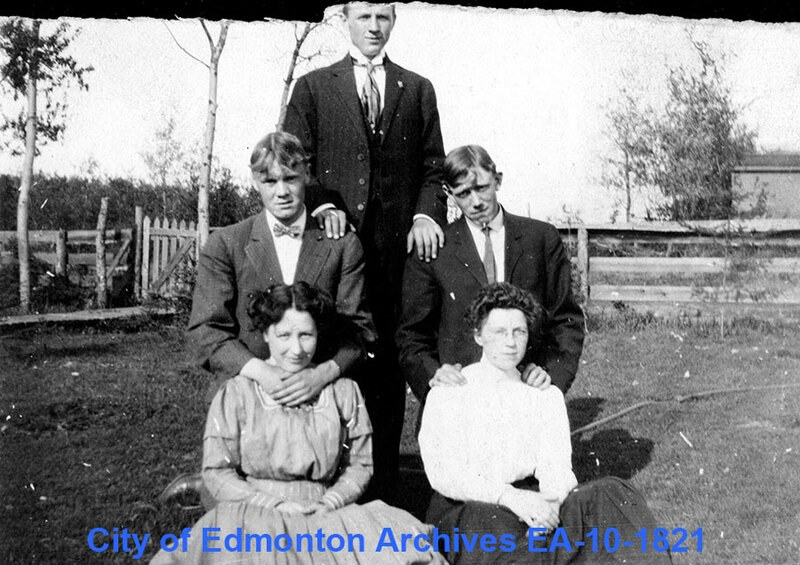 In 1910, she, William and 2 daughters (Maggie and Mary) immigrated to Canada and settled in a home in Strathcona. Unfortunately little else is known at this point.